28 May 2011. Add top three photos. 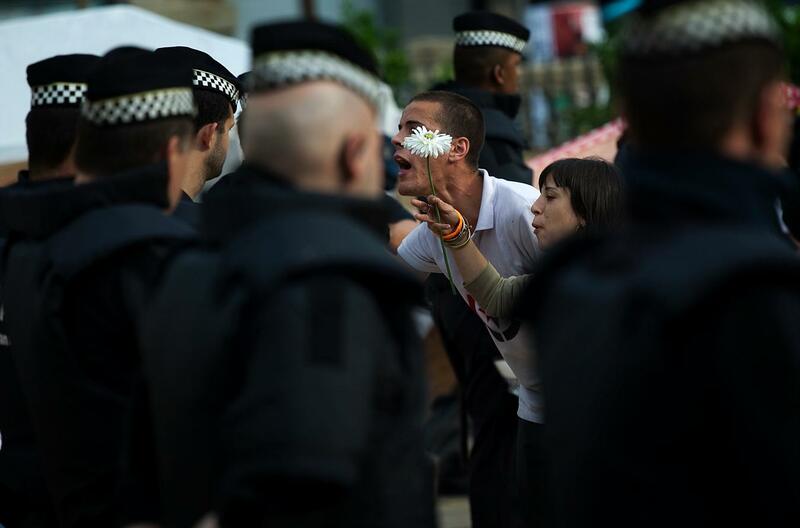 A demonstrator shows his hands covered with blood of a fellow demonstrator as police officers try to remove them during clashes in Barcelona, Friday, May 27, 2011. 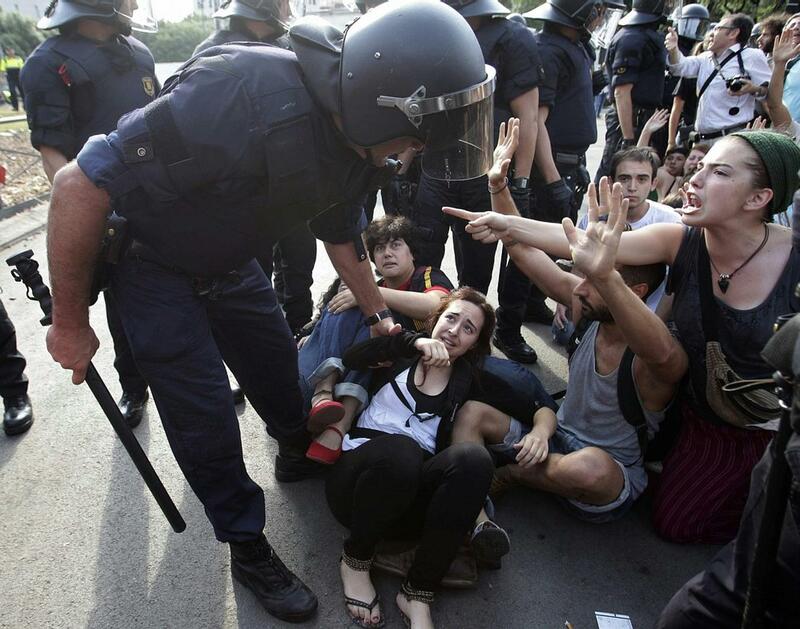 Truncheon-wielding police in Barcelona have clashed with protesters at a makeshift camp that is one of dozens erected in Spain to protest high unemployment and other woes. 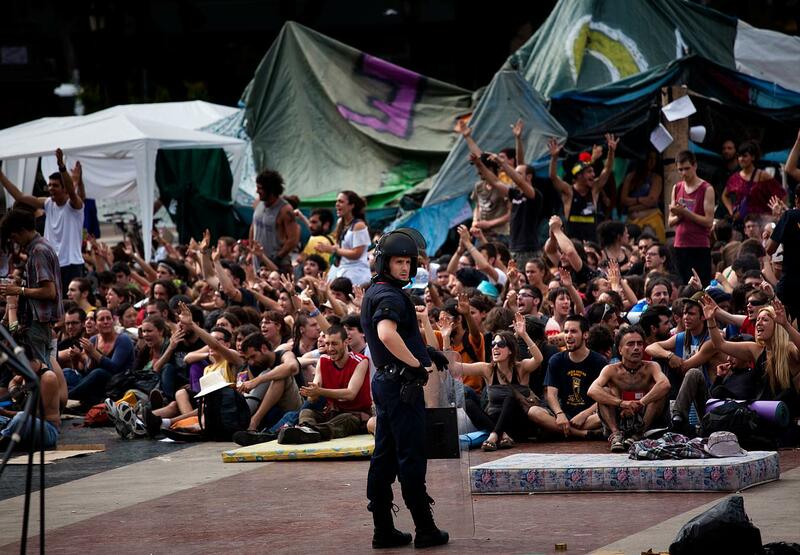 Officers in riot gear were accompanying workers tasked with cleaning up the nearly two-week old camp at Plaza de Catalunya and police used force when protesters would not evacuate the camp temporarily as requested. 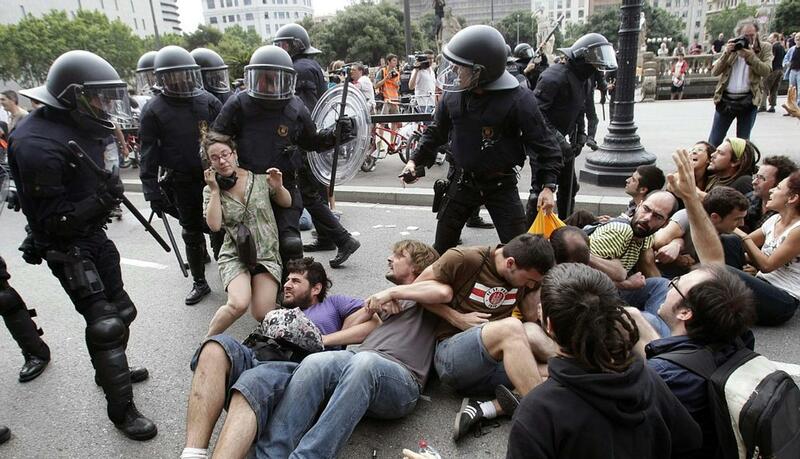 Demonstrators react as police officers try to remove them during clashes in Barcelona, Friday, May 27, 2011. Truncheon-wielding police in Barcelona have clashed with protesters at a makeshift camp that is one of dozens erected in Spain to protest high unemployment and other woes. 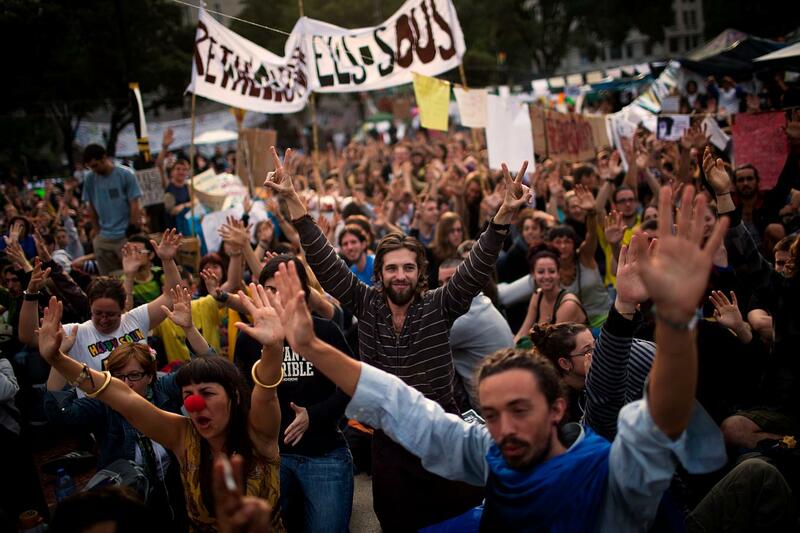 Officers in riot gear were accompanying workers tasked with cleaning up the nearly two-week old camp at Plaza de Catalunya and police used force when protesters would not evacuate the camp temporarily as requested. 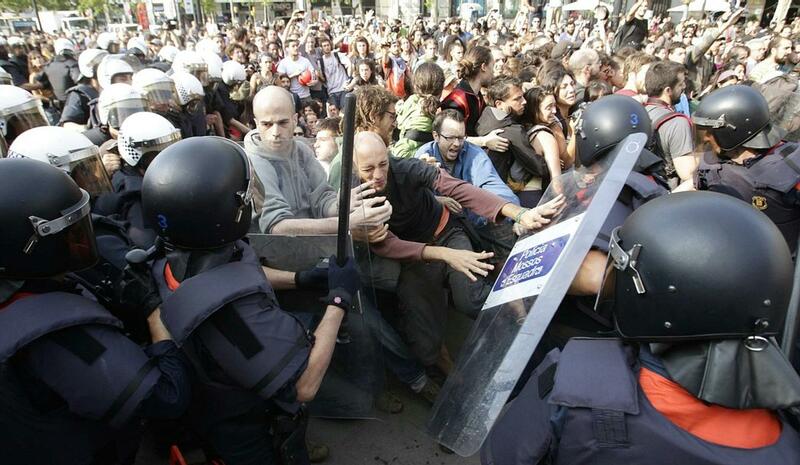 Riot police officers stand next to demonstrators during clashes in Barcelona, Friday, May 27, 2011. 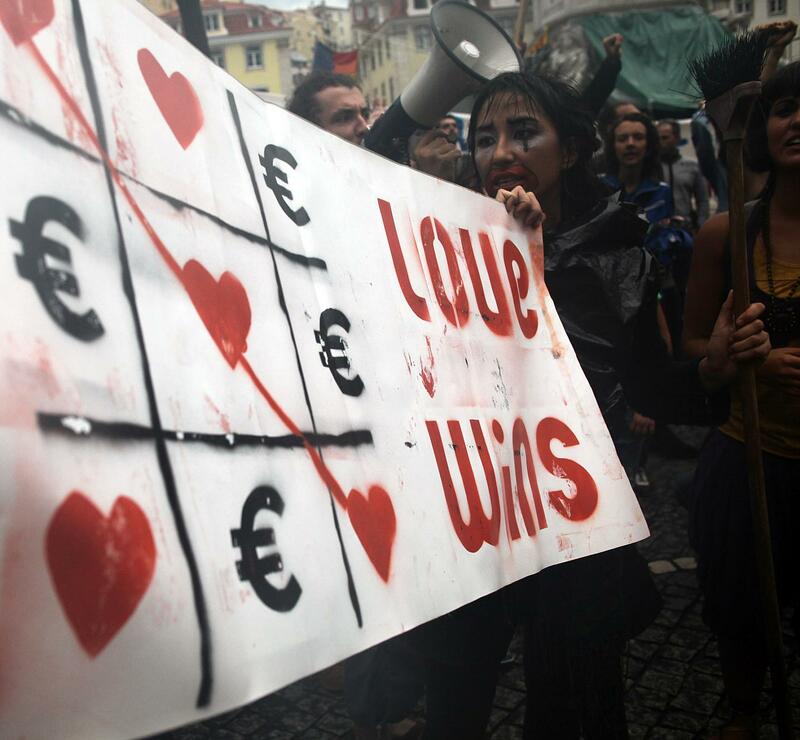 Truncheon-wielding police in Barcelona have clashed with protesters at a makeshift camp that is one of dozens erected in Spain to protest high unemployment and other woes. Officers in riot gear were accompanying workers tasked with cleaning up the nearly two-week old camp at Plaza de Catalunya and police used force when protesters would not evacuate the camp temporarily as requested. 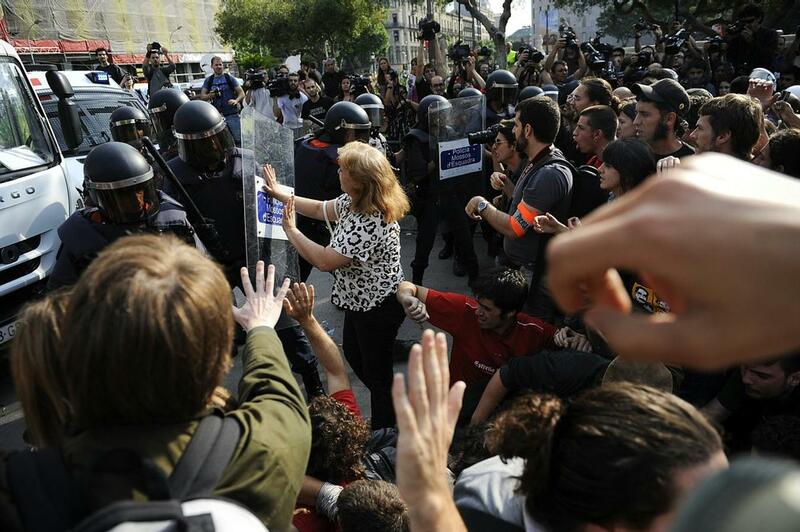 A riot police officer is seen as demonstrators shout slogans before clashes in Barcelona, Friday, May 27, 2011. Truncheon-wielding police in Barcelona have clashed with protesters at a makeshift camp that is one of dozens erected in Spain to protest high unemployment and other woes. 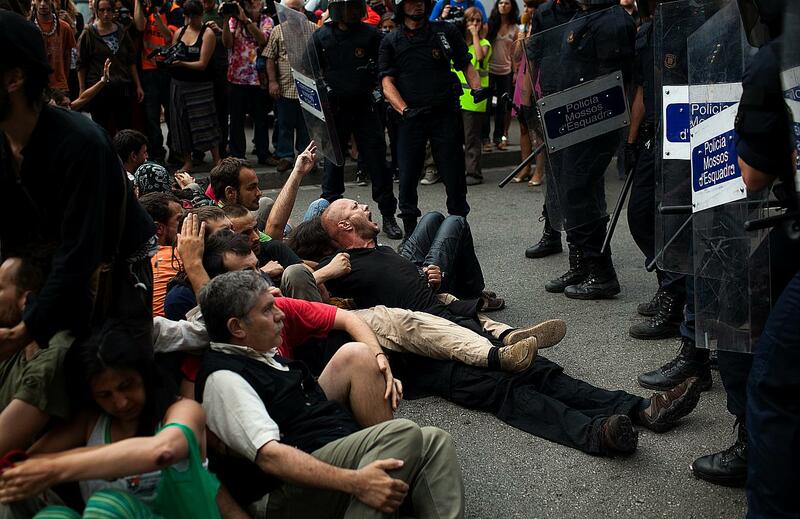 Officers in riot gear were accompanying workers tasked with cleaning up the nearly two-week old camp at Plaza de Catalunya and police used force when protesters would not evacuate the camp temporarily as requested. 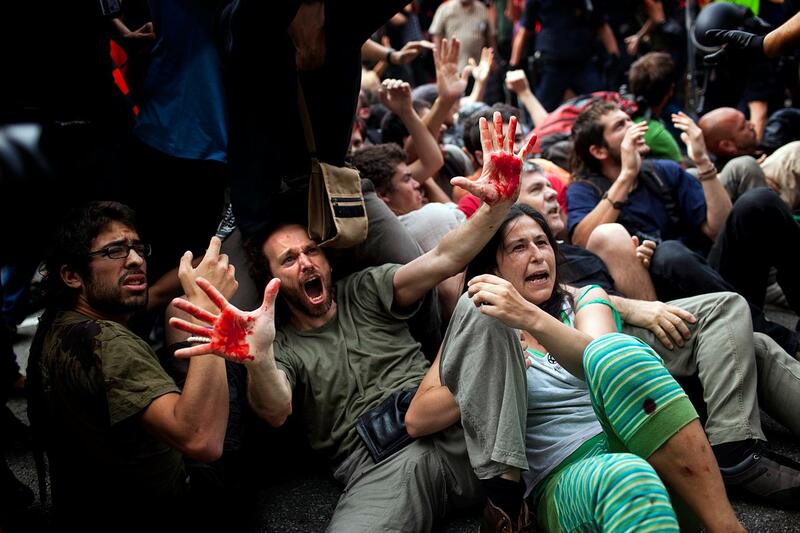 Demonstrators react after clashes with riot police officers during a protest in Barcelona, Friday, May 27, 2011. 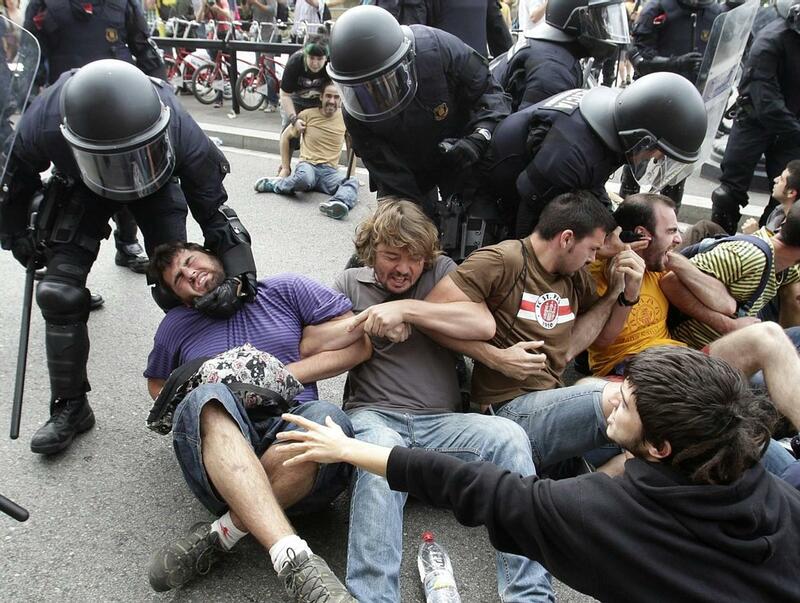 Truncheon-wielding police in Barcelona have clashed with protesters at a makeshift camp that is one of dozens erected in Spain to protest high unemployment and other woes. 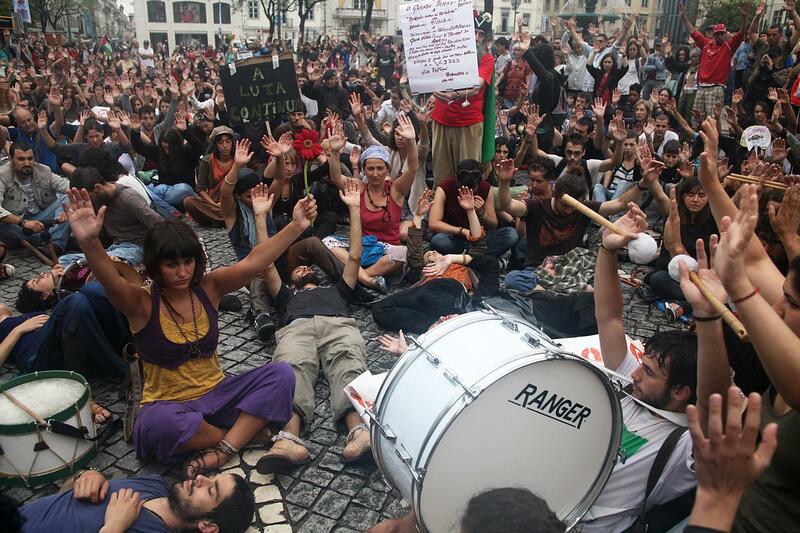 Officers in riot gear were accompanying workers tasked with cleaning up the nearly two-week old camp at Plaza de Catalunya and police used force when protesters would not evacuate the camp temporarily as requested. 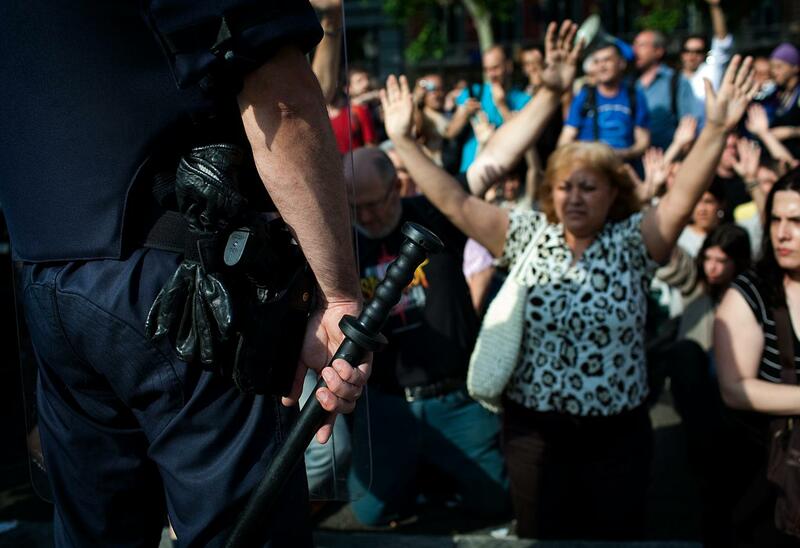 Demonstrators raise their hands in front of police officers during clashes in Barcelona, Friday, May 27, 2011. Truncheon-wielding police in Barcelona have clashed with protesters at a makeshift camp that is one of dozens erected in Spain to protest high unemployment and other woes. 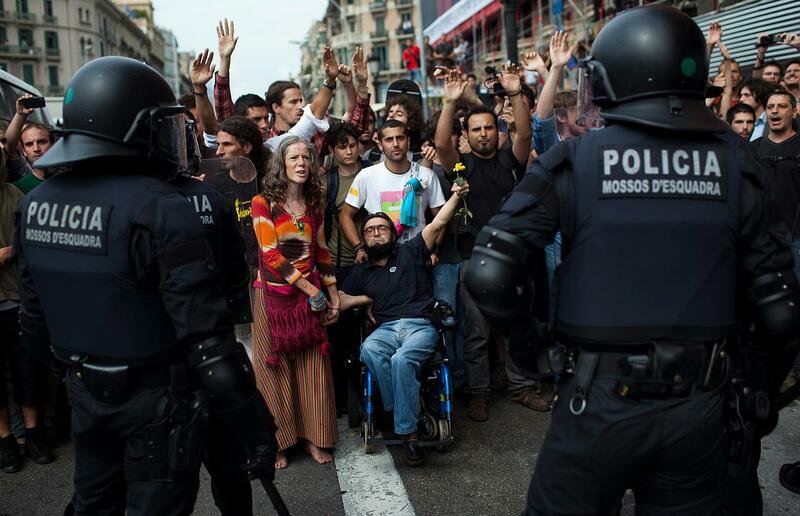 Officers in riot gear were accompanying workers tasked with cleaning up the nearly two-week old camp at Plaza de Catalunya and police used force when protesters would not evacuate the camp temporarily as requested. 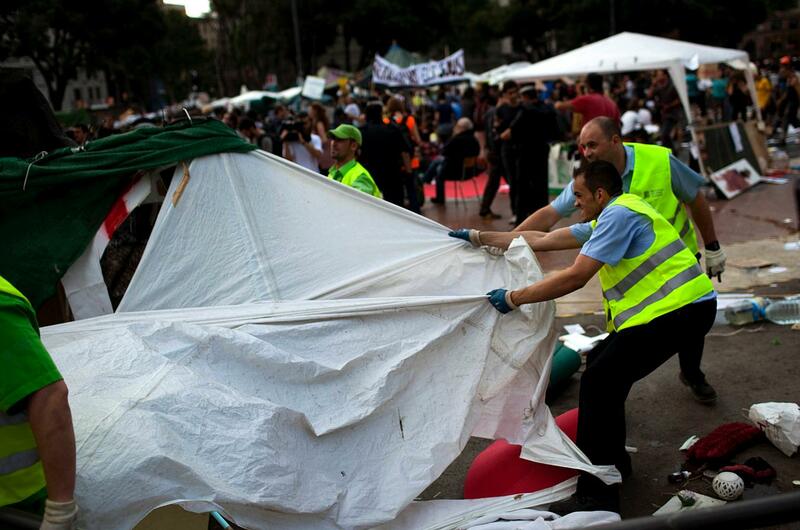 Public workers remove a temporally camp in Catalunya square, Barcelona, Friday, May 27, 2011. Truncheon-wielding police in Barcelona have clashed with protesters at a makeshift camp that is one of dozens erected in Spain to protest high unemployment and other woes. 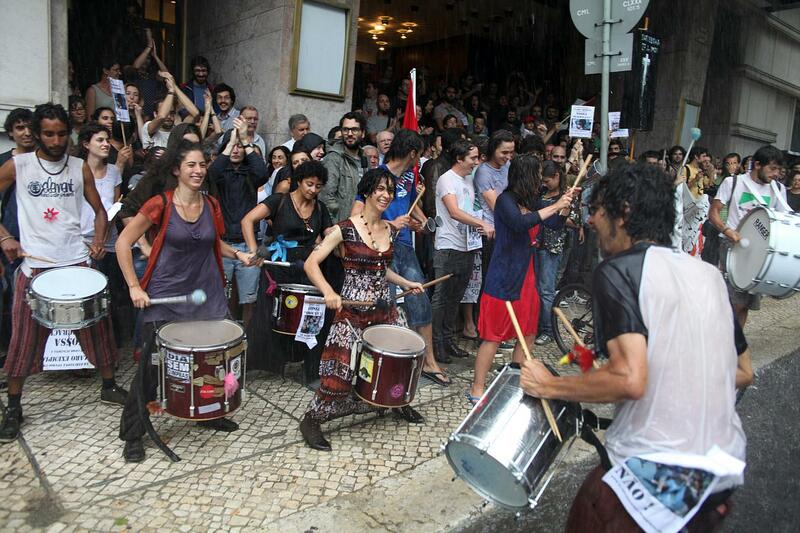 Officers in riot gear were accompanying workers tasked with cleaning up the nearly two-week old camp at Plaza de Catalunya and police used force when protesters would not evacuate the camp temporarily as requested. 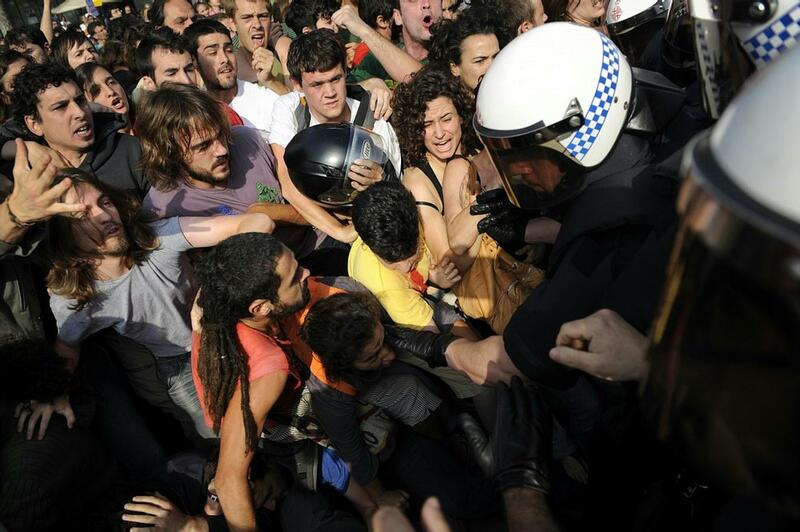 Demonstrators react next to police officers during clashes in Barcelona, Friday, May 27, 2011. Truncheon-wielding police in Barcelona have clashed with protesters at a makeshift camp that is one of dozens erected in Spain to protest high unemployment and other woes. Officers in riot gear were accompanying workers tasked with cleaning up the nearly two-week old camp at Plaza de Catalunya and police used force when protesters would not evacuate the camp temporarily as requested. 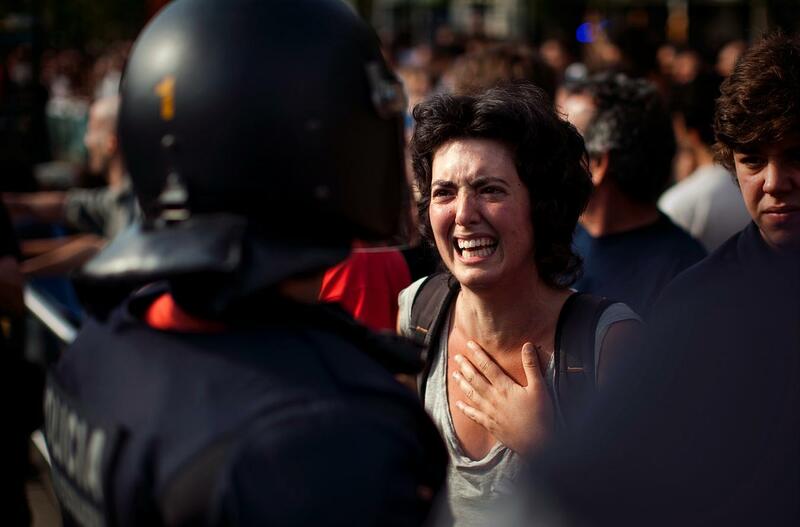 A demonstrator cries in front of a police officer during clashes in Barcelona, Friday, May 27, 2011. 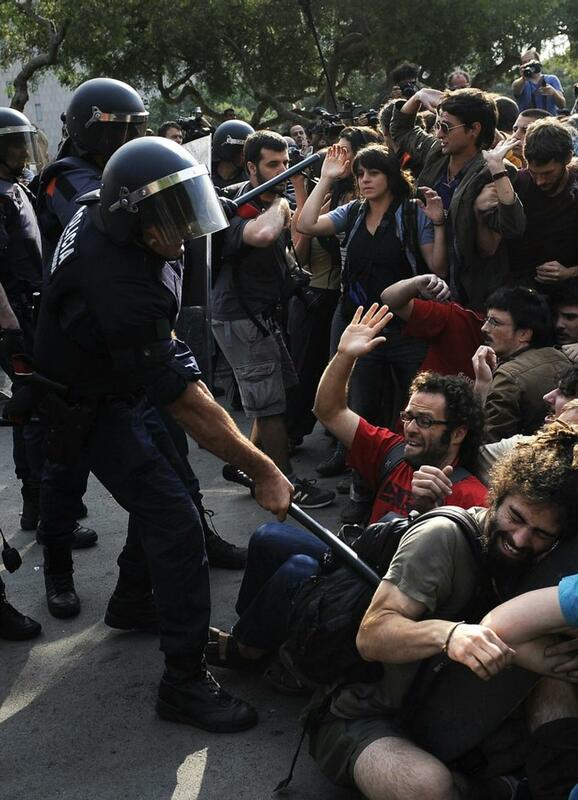 Truncheon-wielding police in Barcelona have clashed with protesters at a makeshift camp that is one of dozens erected in Spain to protest high unemployment and other woes. Officers in riot gear were accompanying workers tasked with cleaning up the nearly two-week old camp at Plaza de Catalunya and police used force when protesters would not evacuate the camp temporarily as requested.